According to a January 2016 CDC report,1 over 47,000 Americans fatally overdosed on prescription opioid pain killers in 2014. This is a stunning fact. But almost as stunning is the apparent lack of concern expressed by the world's media when reporting it. The National Council on Alcoholism and Drug Dependence, for example, thought it worth a mere 214 words.2 NBC News was obviously more excited and pushed their coverage to a hefty 223 words.3 And even those who pushed their word totals up slightly higher ignored the real stories hidden behind the headlines. With that in mind, let's take a look at the CDC report in detail--which virtually no news service did--and then explore the backstory that was pretty much ignored outside of a couple of surprising journalistic players. And finally, I want to take a look a stunning twist to the story that absolutely no one looked at but that to my mind is really the most important takeaway from the whole debacle. First of all, let's make note of the fact that the CDC report is not 200 words long, but 3200 words long. In movie-speak, that means that when the media reported on the story, they left most of it on the cutting room floor. So, what got dumped? As it turns out: the details. And as they say, the Devil is in the details. In broad terms, according to the report, the rate for drug overdose deaths has increased approximately 140% since 2000, driven largely by opioid overdose deaths. This epidemic isn't being driven by illicit drugs, but by a surge in the use of prescription opioid painkillers. According to government statistics, nearly 1.9 million Americans now abuse or are dependent on legal opioids. On the slightly positive side, after increasing steadily every year since the 1990s, deaths involving the most commonly prescribed opioid pain relievers declined slightly in 2012 and remained steady in 2013, showing some signs of progress. Unfortunately, that pause was brief as drug overdose deaths jumped significantly in the last year of the study--from 2013 to 2014. In fact, in 2014, 19,000 people fatally overdosed on prescription painkillers, which represents a 16 percent increase over 2013. Increases in opioid overdose deaths were the main factor in the increase in drug overdose deaths. The death rate from the most commonly prescribed opioid pain relievers (natural and semisynthetic opioids) increased 9%. Concomitantly, the death rate from heroin increased 26%, and the death rate from synthetic opioids, a category that includes illicitly manufactured fentanyl and synthetic opioid pain relievers other than methadone, increased 80%. Nearly every aspect of the opioid overdose death epidemic worsened in 2014. And then there's heroin. In fact, heroin overdose deaths have been sharply increasing since 2010. Surprisingly, as we will discuss later, heroin overdose deaths may not mean quite what you think they mean. Now, as bad as those broad statistics are, the details behind this epidemic of drug overdose deaths are even worse. Since 2000, the rate of deaths from drug overdoses has increased 137%, including a 200% increase in the rate of overdose deaths involving both opioid pain relievers and heroin. During 2014, a total of 47,055 drug overdose deaths occurred in the United States. From 2013 to 2014, the largest increase in the rate of drug overdose deaths involved synthetic opioids, other than methadone (i.e., fentanyl and tramadol), which nearly doubled from 1.0 per 100,000 to 1.8 per 100,000. Meanwhile, as already stated, heroin overdose death rates increased by 26% from 2013 to 2014 and have more than tripled since 2010, from 1.0 per 100,000 in 2010 to 3.4 per 100,000 in 2014. As the CDC report explained, from 2000 to 2014, nearly half a million persons in the United States died from drug overdoses. But it gets worse. The killer statistic is that more people died from drug overdoses in the United States in 2014 than during any previous year on record. In 2014, there were approximately one and a half times more drug overdose deaths in the United States than deaths from motor vehicle crashes or gun violence.4 Let that sink in for a moment. Again, we're talking about prescription pain relievers and heroin as the main drugs associated with these overdose deaths, and, surprise, those heroin deaths are likely connected to prescription pain relievers, not to junkies on the street. 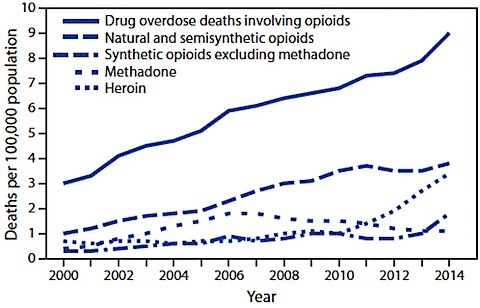 In summary, the 2014 data demonstrates that the United States' opioid overdose epidemic includes two distinct but interrelated trends: a 15-year increase in overdose deaths involving prescription opioid pain relievers and a recent surge in illicit opioid overdose deaths, driven largely by heroin. Drug overdose deaths involving heroin have continued to climb sharply, with heroin overdoses more than tripling in 4 years. This increase mirrors large increases in heroin use across the country and has been shown to be closely tied to opioid pain reliever misuse and dependence. Past misuse of prescription opioids is the strongest risk factor for heroin initiation and use, specifically among persons who report past-year dependence or abuse.5 As it turns out, the increased availability of heroin, combined with its relatively low price and high purity (compared with diverted prescription opioids) appear to be major drivers of the upward trend in heroin use and overdose.6 Finally, illicit fentanyl is often combined with heroin or sold as heroin. Illicit fentanyl might be contributing to recent increases in drug overdose deaths involving heroin. Therefore, increases in illicit fentanyl-associated deaths might represent an emerging and troubling feature of the rise in illicit opioid overdoses that has been driven by heroin. Bottom line: we're not talking about your typical junkies now, but average people (your friends, neighbors, and co-workers) migrating from prescription pain killers prescribed by their doctors to addiction and then to heroin--and dying as a result. In the old days, when reporters actually worked stories and practiced journalism, they would have run with the CDC report (heck, they would have actually looked at the CDC report itself rather than merely copying the AP summary of that report) and dug into the story behind it--perhaps even turning it into a series of reports exposing the underbelly of what has grown to become one of the leading causes of death in the United States. But that's when reporters were paid to actually ask questions. As stated in their article, "Addiction experts say doctors have fueled this crisis by recommending that patients with even minor ailments and aches take highly addictive opioids like Vicodin, Percocet, and OxyContin. Physicians wrote 259 million opioid prescriptions in 2012, triple the number two decades ago and enough to provide every adult in the country with a bottle of these pills." They then went into the history behind prescription painkillers. I've expanded upon it. For centuries--before pharmaceutical drugs--people relied on natural pain killers like opium. In fact, laudanum, which is a tincture made from opium, was used as a painkiller as far back as the 1500s until it fell out of favor because of its addictive nature. It was replaced by morphine, an opium isolate that Merck began marketing in 1827. Unfortunately, morphine is even more addictive than laudanum, which caused it too to fall out of favor. Amazingly, morphine was replaced by heroin, which was marketed by Bayer as a non-addictive opioid alternative--despite the fact that it is synthesized from morphine and is two to four times stronger than morphine. Nevertheless, doctors believed the marketing hype and prescribed heroin extensively from the late 1800s to the early 1900s. Obviously, it soon became abundantly clear that heroin was anything but non-addictive. This provided yet another opening for the pharmaceutical companies, which they grabbed onto with a vengeance. In 1917, three years before heroin was banned in the US, oxycodone was developed by two German scientists. Oxycodone is a semisynthetic opioid synthesized from an alkaloid found in the Persian poppy. In 1939, it was introduced to the US, but it was not until 1950 when it was combined with aspirin and sold as Percodan that it really took off as American physicians began to prescribe it by the truckload. By 1963, the state of California had determined that one-third of all drug addiction in the state was the result of Percodan abuse. Nevertheless, it still took another seven years before the DEA classified it as a Schedule II drug with a high potential for abuse. "In fact, when OxyContin went on sale in 1996, Purdue launched a "promotional campaign unlike [anything] we have ever really seen," says opioid abuse expert Dr. Andrew Kolodny. The company gave doctors 34,000 coupons for free OxyContin prescriptions, bombarded them with branded stuffed toys and coffee mugs, and aggressively promoted the idea that the new drug, which is stronger than morphine, was both safe and highly effective. "Drug reps were going to family-care doctors and insisting that OxyContin had no real risks -- only benefits," says Kolodny. Purdue pleaded guilty in 2007 to criminal charges that it misled regulators, doctors, and patients about OxyContin's addictive qualities. But by that point, hundreds of thousands of Americans were hooked." By 2011, according to an IMS Health National Prescription Audit, 219 million opioid prescriptions were being handed out each year.10 At that point, the prescription painkiller crisis could no longer be ignored, and federal, state, and local law enforcement began to crack down on both drug abusers and doctors who over-prescribe and pressed for the establishment of prescription drug monitoring programs that make it more difficult for drug abusers to get prescriptions from more than one doctor. The number of states with prescription drug monitoring programs has more than doubled, from 20 states in 2006 to 48 states now. Unfortunately, no good deed goes unpunished. The use of opioid should be controlled and it should be followed to activate the natural synthetic opioids withing the body. This research paper writing service helps to understand the previous history on using pain killer for management of the patient with chronic disease conditions. More and more research should be conducted in order to understand the actual way for managing the chronic pain. This page contains a single entry by Archimede published on March 15, 2016 3:47 PM. Pharmaceutical industry: A dose of reality was the previous entry in this blog. WHO Backs Trials of Bacteria, Genetic Modification to Fight Zika Mosquitoes is the next entry in this blog.